Bad breath in dogs is usually the result of some form of dental problems, but it can also be caused by a number of health issues, such as poor digestion, poisoning, and kidney failure. 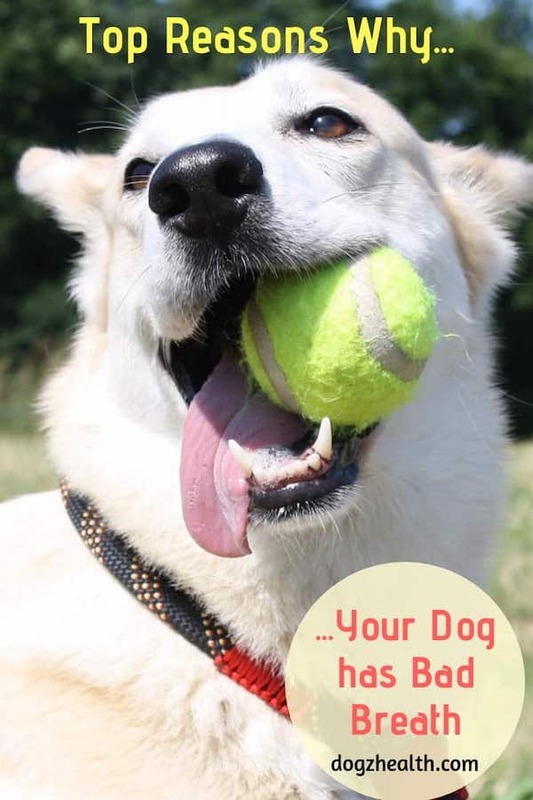 Read this page to find out some common possible causes and what we can do to get rid of dog bad breath. Dog bad breath (halitosis) is not just what some people consider as “doggie breath”. It is offensive and foul-smelling and is an indication of some kind of health problems. If your dog suddenly has really offensive bad breath, do not brush it off as “just doggie breath”. Be sure to look for other illness symptoms and, if the bad breath persists, visit the vet. There are quite a few things that can cause canine halitosis. Below is a list of some common causes. Periodontal problems are common causes of bad breath in dogs. These problems include issues such as gingivitis (bacteria build-up between the gums and teeth, leading to inflammation of the gums), and more seriously, periodontitis (a continuation and deterioration of gingivitis, leading to inflammation of the tissue surrounding the affected tooth or teeth). In both cases, the hallmark symptom is bad breath. So the first thing to do when you notice your dog’s bad breath is to check his gums. Other symptoms associated with gum diseases include red and swollen gums, bleeding, and sometimes pus oozing along the gum line when the gums are pressed. Also, the dog will show signs of pain such as drooling and reluctance to eat. An abscessed tooth can also cause bad breath in dogs. Root abscesses can occur in any of the teeth, but most commonly in the canines and the upper fourth premolars. Besides bad breath, other signs include fever, pain leading to depression and appetite loss, and pus oozing around the affected tooth. Sometimes stinky dog breath is caused by a foreign object that has been trapped in the dog’s mouth for a couple of days. While examining the dog’s mouth for possible periodontal problems, also check to make sure that no foreign objects are caught between the teeth, in the gums, or embedded in the tongue. If you see an object in the mouth, try to remove it carefully. If it is not possible for you to do so, take your dog to the vet. 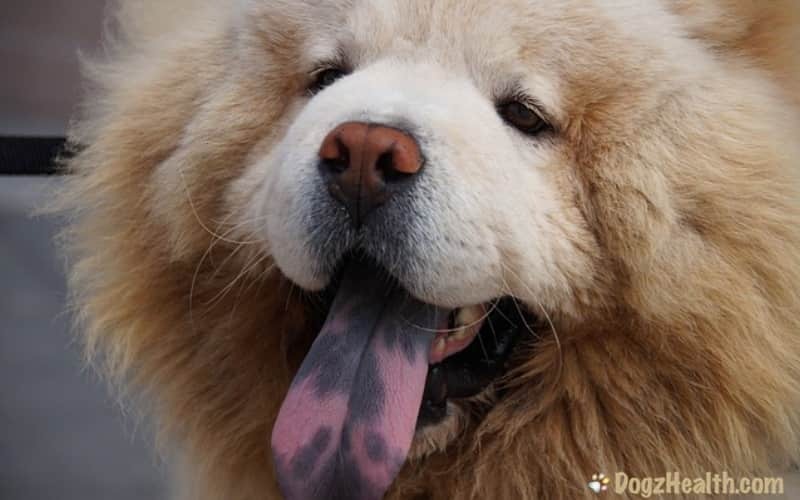 Tumors such as melanomas, squamous cell carcinomas, and fibrosarcomas can occur in the mouth, especially in older dogs. Some tumors such as melanomas can spread very rapidly to other parts of the body. One characteristic sign of mouth cancer is also bad breath. Other possible signs include drooling, facial swelling, bleeding from the mouth, and loss of appetite. These signs are very similar to those of periodontal diseases. It is important to take your dog to the vet for a thorough check-up if you see these symptoms in your dog. Poor digestion may result in gastrointestinal problems such as constipation, gas, or diarrhea, all of which can lead to bad breath. Low-quality kibbles tend to cause poor digestion (and bad breath). Switching to a high-quality natural diet usually can help solve the problem. Supplements such as probiotics and digestive enzymes can also be used to help with digestion. Dogs suffering from severe kidney failure retain ammonia and other chemical wastes in their blood and tissues. This results in an ammonia-like odor to the breath. Other symptoms at this stage of kidney failure include appetite loss, weight loss, depression, dry hair coat, and a brownish discoloration to the surface of the tongue. Some form of poisoning causes a distinct odor in the dog’s breath. For example, phosphorus poisoning (used in rat and roach poisons, matches and matchboxes) causes the dog to have a garlic odor to his breath. Arsenic poisoning (used in herbicides, insecticides, and wood preservatives) also causes the dog to have a strong garlic odor. Other signs of poisoning including vomiting and diarrhea, abdominal cramps and pain, and convulsions. Some dogs have the bad habit of eating their own or other animals’ poop (a condition known as copraphagia), which of course will give the dog stinky smelly breath. 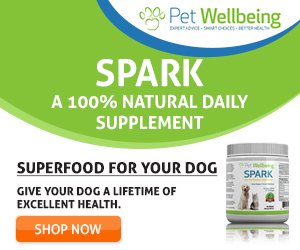 Stool eating may be caused by some underlying health problems, such as exocrine pancreatic insufficiency, in which the dog does not have enough digestive enzymes to digest his food. Therefore, he seeks out other animals’ poop to get the nutrients he needs. On the other hand, sometimes some dogs (especially puppies) eat poop just out of curiosity or boredom! If your dog has this unappetizing habit, it is a good idea to get him to the vet for a checkup to see if the habit is caused by an underlying health problem. Brush your dog’s teeth regularly (at least 4 to 5 times a week) to prevent tartar build-up and subsequent periodontal diseases. Use a dental spray such as Dog Breath Freshener – Spray Me . This 100% natural mouth spray contains grapefruit seed extract and various herbal oils that can not only freshen a dog’s breath, but also promote oral health inside the mouth, supporting and maintaining healthy teeth and gums. Have your dog’s teeth checked and cleaned once a year by a veterinary dentist. Use dog snacks such as hard fresh vegetables and fruit (e.g. carrots and apples) to help keep the teeth clean. Use hard chew toys such as KONG Extreme Toy Dental or toys made from strong hard ropes such as Flossy Chews Cottonblend Color 3-Knot Rope Tug to help clean your dog’s teeth. Avoid giving your dog sugary or sticky treats such as ice cream, candies, and sweetened milk. Sugar can harm their teeth. Encourage your dog to drink plenty of fresh water daily. Add breath-freshening herbs (e.g. dill, parsley) to your dog’s food. Improve your dog’s digestion by giving him supplements of digestive enzymes (such as Prozyme ) and Probiotics .